This entry was posted in Alcohol, Success Story and tagged Substance Abuse on October 22, 2012 by ATMC Team. 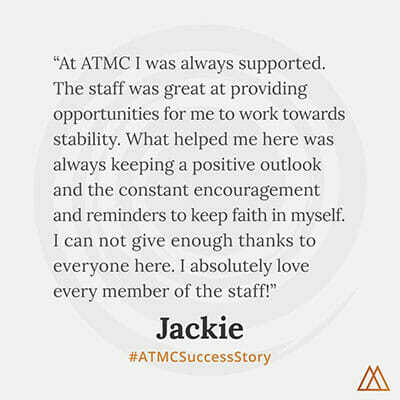 The staff at ATMC helps me daily … Since the staff has overcome issues that are similar they are able to relate with me and they are always available to give help one on one. My name is Roni and I have struggled with alcoholism and bulimia since I was 13 years old. I was using alcohol as an escape from the memories I had of past abuse. In the beginning, bulimia was a way that I could lose weight to play sports. But soon I realized that I was going through two fifths of alcohol just to make it through the day. I was then purging and binging up to five times daily to deal with my self-hatred. I started going to AA meetings during the summer – this was great for managing my alcohol abuse but my bulimia was becoming more severe. I finally arrived at ATMC. I found the reasons here for my behavior and effective methods of gaining some self esteem and caring for myself. I was also able to taper safely off of 7 different psychiatric medications! During the time I’ve spent at ATMC, I’ve been working and talking to a nutritionist who has overcome bulimia successfully. She has helped a lot through talking to me along with performing extensive testing to identify where I was deficient nutritionally. She identified that I lacked several nutrients which could cause continuous bulimic tendencies. I have been using supplements that are improving my nutritional state and boosting my neurochemistry. It was then a lot easier to stop myself from having the craving to purge and it took around 3 weeks in order for my emotional-being to stop the negative thinking. T.J., an Estates Manager and Chef, showed me how I can choose and prepare delicious and healthy alternatives in my own kitchen. Cassie, the Detox and Supplement Supervisor, has always been available to talk to me. She helped me to handle the pain related to the emotions and pain of being a survivor of abuse. The Program Director, Issac, helped me to face my fears which resulted in more self-esteem and confidence. Mark and Emily have taken me with them to AA meetings; they have also been there whenever I needed someone to talk to. The Course Supervisor, Jason, has taught me all about the supplements and vitamins that I take and the way they work to restore brain chemistry without side effect risks. Also, I know now that exercise and proper nutrition can have positive effects on view on life and overall condition! I am just so happy and thankful that I came here to ATMC – as I no longer have the desire of just disappearing or being “6 feet under”! I want to continue living healthy and happy! Here I was taught the life skills that I need to do that and go home with absolute confidence that I’m able to be healthy and I can succeed in life!